The latest in a series of competitions sponsored by Urban Revision has begun. Previously, each competition had focused on an aspect of the urban block: energy in Re:Volt; transportation in Re:Route; and commerce in Re:Store. 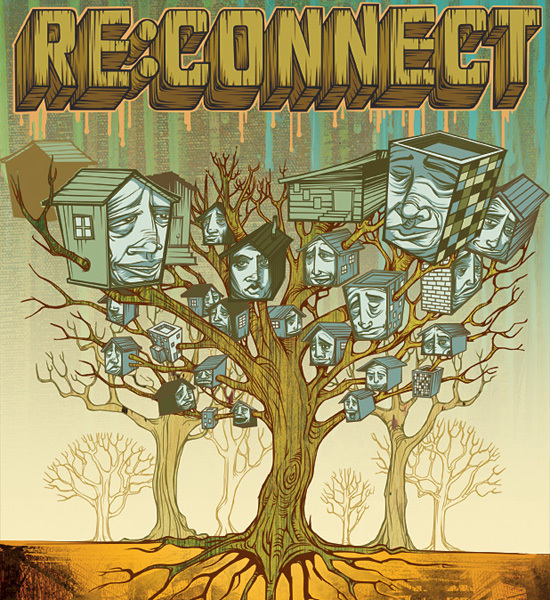 In Re:Connect, participants are asked to focus on community. The character of a neighborhood is a reflection of the people who live there. When people feel connected to a place, they feel more connected to one another. The community becomes an extended family and life more meaningful. Thus, we're looking for urban planning approaches where revamped environments bring current residents together, particularly families. This is a chance to repair the essential relationships between social work, nature and urban infill with ideas that value humanistic thinking and imagination over bulldozers. Ponder the kinds of structures and landscapes that typically exist in run-down areas and transform them into eco-wise spaces that make life better. How might you overcome the inevitable resistance to change, and harness the community's human resources? Introducing eldercare and childcare programs or sustainable landscaping with useable harvests might be just what's needed. The best plans, no matter their originality or scale, will aim to positively affect neighboring blocks as well. If you're planning to approach this via landscape design, for inspiration, there's Kevin Robert Perry's stormwater management systems, the East Saint Louis Action Research Project and projects by the phenomenally great Walter Hood, specifically Courtland Creek, Lafayette Square Park and downtown Macon, Georgia's Poplar Street. And since the last line in the competition brief quoted above did say that entries needn't be completely original, perhaps you can reinterpret Edible Estates or spatialize these John Pfahl photographs. In any case, the registration deadline is June 1, and the submission deadline is June 15. However, these dates may change.